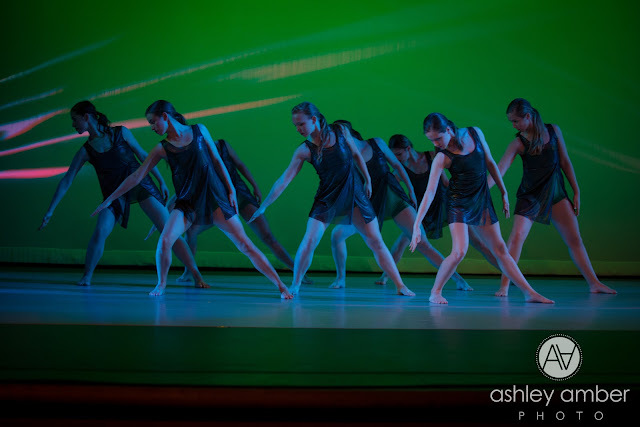 Thanks to everyone who attended the 2013 FAC Spring Dance Concert on Friday evening. It was an hour and a half of pulse-raising performance that was, by turns, exhilarating and poignant. This was the final public FAC performance for an outstanding group of talented seniors (two of whom are also valedictorian of their senior classes) who have been accepted into prestigious college programs and will be moving on to bright futures. We wish them well on their journeys. Special thanks to Ashley Amber photo for the extraordinary shots. 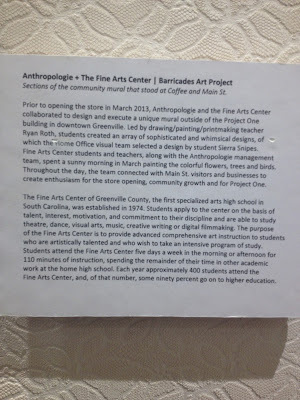 As many of you know, a group of Fine Arts Center Visual Arts students gathered in downtown Greenville on March 9 and 10 to do a live installation of artwork for the barricade of the soon-to-open Anthropologie store. The design chosen for the mural was by FAC sophomore Sierra Snipes. 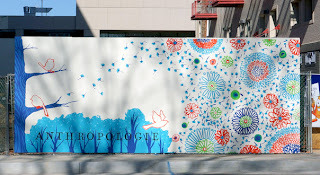 After the store opened, Anthropologie selected a few sections of the piece to be included in the interior decor of the store, alongside a plaque describing the work. 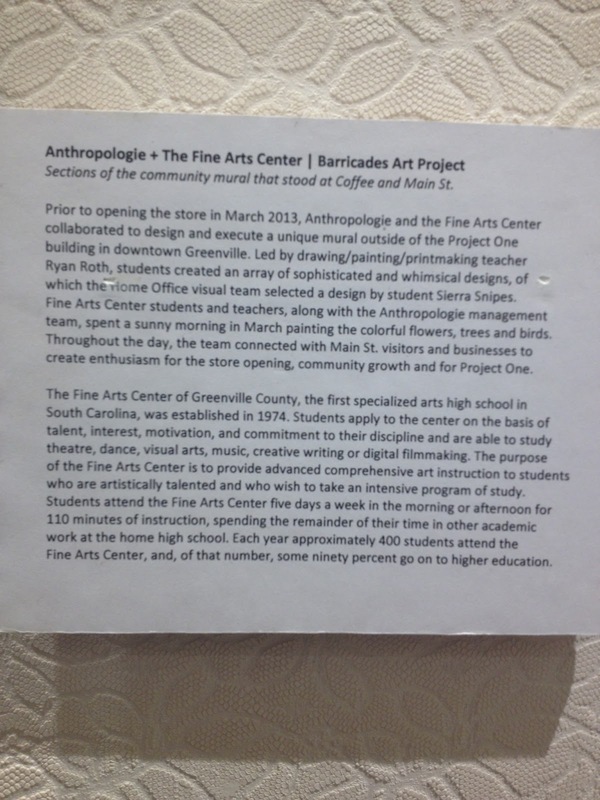 Come join us for The Fine Arts Center’s Annual Spring Juried Art Show and reception on Thursday, April 25, from 6:30-7:30 p.m. in the Sheffield Wood Gallery, followed by a free concert at 7:30 p.m. in the Sutherlin Recital Hall by Asheville-based ensemble Pan Harmonia. The artwork features 2D and 3D work by students in the Clay, Metals, Photography, Drawing, Painting, and Design classes. Artists Tom Dimond and Terry Jarrard Dimond juried this year’s exhibition. Wonderful dance performances are not rare in Greenville, since a number of great local companies and touring troupes perform here regularly, but the chance to see exceptionally talented young dancers performing the works of top-tier choreographers in an intimate setting and for mere pennies IS rare indeed. The Fine Arts Center Dance Concert will take place Friday, April 26, at 7 p.m. in the theatre at Wade Hampton High School (adjacent to the Fine Arts Center). This venue is the perfect setting, as there's not a bad seat in the house! In addition, admission to this event is only $5. Wait, that cannot be right, can it? Did I misplace a zero or drop a digit? Nope. Five bucks it is (although the dance program will gladly accept donations). The repertory will include choreography by Tim Glenn (Associate Professor in the School of Dance at Florida State University and former dancer with Nikolais & Murray Louis Dance Company), Sara Procopio (founding member and former Artistic Associate of Shen Wei Dance Arts), Tyler Gilstrap (founding member of Battleworks Dance Company and featured dancer in such films as Across the Universe), Andrew Kuharsky (Director of the Greenville Ballet) and Rebecca Lee (Wildwood Ballet and FAC alumna). Still not convinced that you don't want to miss this? You can see a number of videos from last year's concert here. Wanna know more about FAC dance? We think this says it all. You may also follow the FAC Dance blog. We'll see you on the 26th! 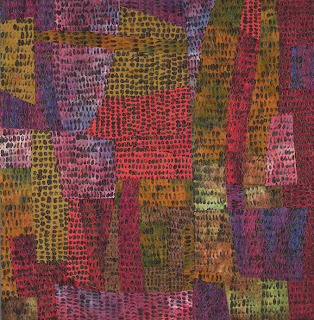 Manuscript One, a piece by fiber artist Terry Jarrard-Dimond, who did a weeklong residency at FAC earlier this year, has been selected to join the permanent collection at the Fine Arts Center. Terry has written a wonderful blog post about the selection that discusses the piece, her work, her residency at FAC, and her time with the students there. Take some time to read her post and navigate through her blog. It provides some wonderful insights into the mind of this talented and thoughtful local artist.